Seen on the bumper of a big, man-driven truck! 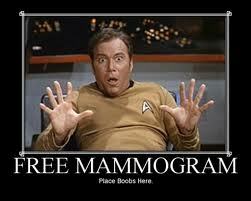 Last night I got my annual mammogram. Most women need to go once a year or once every two years from 40 until 79 . I get one every year because my Mom had breast cancer – TWICE! She survived it both times because it was caught early enough. Women with a history of breast cancer in close relatives in their family should get a benchmark around 35. It didn’t take long, 30 minutes from start to finish including the waiting room and the questionnaire. Sure, it can be embarrassing and sometimes even painful but… the technician was a woman, the machine was pink and white and I was only a little uncomfortable with the squishing. No pain – that’s good. I know my breasts, I’ve had them since I was 11 and I’ve kinda grown attached to them. I was also taught BSE in high school. Yes, when I was 16, the Canadian Ministry of Health was promoting Breast Self-examination for all women. So where do you start? You start in high school where breasts are so very, very interesting. It’s something that should be done once a month but not in the week before your period. Women know why that’s not a good idea. And later on in life you can even share the monthly experience with your better half! If your better half is a man, maybe he’ll let you help with the monthly testicular check????? Breast cancer can happen to fat women, skinny women, young women, old women, women who have never had children and women who had lots. I can happen to poor women and rich women, women who breast-fed and those who didn’t. Your ethnic background may matter a bit but maybe not. Don’t take chances. It can even happen to men. 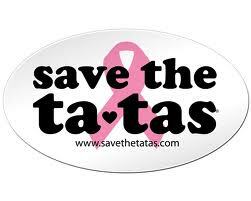 2 % of breast cancers diagnosed, are in men over 50. It shows that everyone – really, everyone – needs to know their own breasts. I have ropy breasts. Yep, it is as weird as it sounds. They look OK, but I know when things aren’t quite right. I know what they’re supposed to look like and WOW have they ever changed since I was 11. They have been though many phases and stages. Perky was never in my vocabulary. I’ve lost 70 pounds in the last 2 years and we all know that the last place for weight to show is your breasts but it’s the first place to leave. There are all kinds of risk factors for breast cancer and I don’t want to scare the crap out of anyone. Smoking, weight, vitamin deficiency, injuries, exposure to chemicals and radiation, are only a few things that could cause anomalies (I love this word!). Do a BSE every month and work with your doctor – they should be doing a breast exam every year with your physical. Do not worry – be in control. The more information you have and the more you know about your own body, the easier it is to be prepared. Exercise, diet, happiness and love will all help create a healthy you! Let’s fight the anxiety having breasts produced in a lot of us. Even a small lump can be removed by needle now with no further complications or treatment. Women (and men) can survive and they do. Some don’t and we love them and remember that they were a wonderful part of our lives. So, take care of yourself and do a BSE, get a mammogram, get your PAP test (if you are sexually active! ), know your body and live healthy. That goes for you men, too! That human papilloma virus lives in your body parts, too!!!! ~ by 1fatgirlshrinking - Diane Kirby on August 24, 2012.